((You can add in more vegetables like cauliflower/ brocolli/ capsicum...but then the quantity of below ingredients will change in proportion to the quantity of veggies used)). Wash and clean the veggies. Wipe all the moisture. Chop/ dice them as required. Mix these veggies in a bowl along with cornflour and salt. Now add the oil mixture and toss it well, taking care that the dressing coats the veggies. Sprinkle chopped mint leaves/ corriander leaves and mix it again. Preheat oven to 220 degree celsius. Line a baking tray with heavy duty aluminum foil paper. Spread the veggies mixture in the tray and bake it for 35-40 mins. After 20 -25 mins or so remove the tray and sprinkle some curry powder, gently stir it [ you can omit this step if u dont need them very spicy] and again keep it back for remaining time till the veggies are crisp and done. 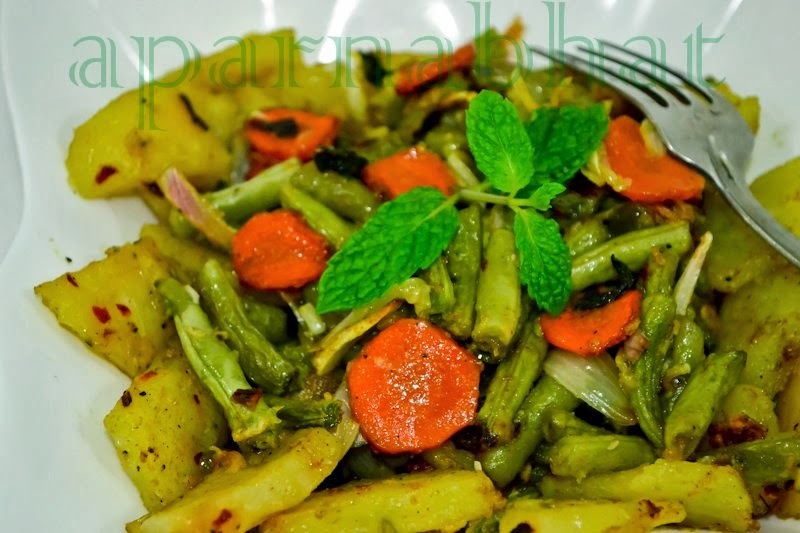 Spicy minty baked crisp veggies are ready for munching.